Another stormy weekend chez Wendy House. A temporary break in the flood production system. No rain this morning. Laundry to be washed and dried. No modern tumble-drier accessories. 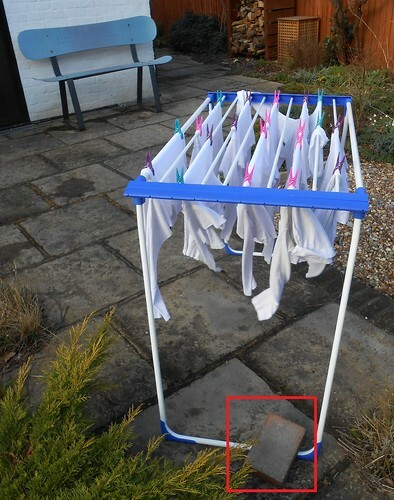 My laundry its catching some rare sun rays in the Wendy House wind-swept garden. Extra ballast had been added to the ‘airer’ to prevent it attempting a take-off garden tour. Bricks. The ships that carried lumber from Seattle to San Francisco, to build the beautiful houses there, carried stone back to Seattle as ballast to weight the ships appropriately on the return journey. The stone was used to build many of the Historic buildings in the Pioneer square area of Seattle. Awesome. The RSPCA has warned that cats are likely to take-off in these strong winds. Despite her own substantial personal ballast, Sampo’s a cautious cat. Sampo’s not risking any unplanned flights.